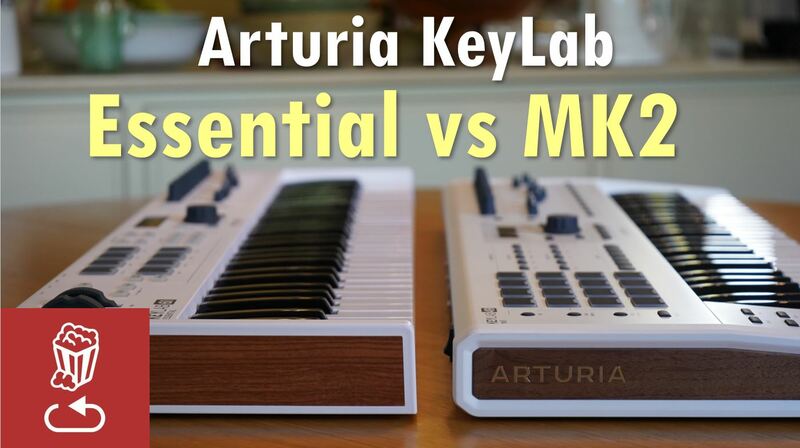 Arturia KeyLab MK2 vs KeyLab Essential: Is it worth the price difference? Arturia’s KeyLab Essential and the new KeyLab MK2 look quite similar but the premium MK2 version costs about two and a half times more than Keylab Essential. Let’s take a look at the real differences between them, the pros and cons of each, and review the competitive marketplace. Let’s start with what they are – both are designed to serve a few functions – a couple which I think may get overlooked. The first is to be a keyboard MIDI controller for software based instruments, with an emphasis on a tight integration with Arturia’s software instruments and in particular Analog Lab, which comes bundled with both keyboards and has over 6,500 presets of different types of instruments including synths, pianos and organs. The second is a Digital Audio Workstation controller – with support for quite a few DAWs including Ableton Live which is the hardest to support due to its grid based layout. The third function, and I think is one that isn’t talked about much, is that they are actually quite capable standalone customizable hardware MIDI controllers, with swappable hardware templates you can use without a computer. And fourth, and this is relevant just for the higher end MK2 series, is a hardware/software bridge between MIDI and modular gear and your computer. In terms of hardware differences, visually what you’ll notice first is that the MK2 has 16 pads instead of 8, more chord and DAW control functions and an additional row of controls under the knobs and faders which are very helpful when controlling your DAW and Analog Lab. The build itself is very different between the two – Keylab Essential is plastic and the MK2 is aluminum with wood on the side. The wood is less important in my opinion but you do notice the difference in overall sturdiness and premium feel on the MK2, though if I had to choose which to take on the road I would pick the KeyLab Essential because it’s much lighter. The keys themselves are different – the MK2 keys are taken from Arturia’s flagship MatrixBrute synth and have aftertouch, which works quite nicely. The velocity sensitivity works well on both, and they’re both very playable. When making a direct comparison, the MK2 keys definitely feel better but it’s not something you notice if you get used to KeyLab Essential. The knobs and sliders feel very similar to me, though there’s more travel distance on the MK2 which gives you finer control. The pads on both are velocity and pressure sensitive – the ones on the Essential actually stick out a bit more and feel better in my opinion. The rest of the buttons are “clicker” and feel more professional on the MK2 compared to the rubbery ones on the Essential, but I’ve not had an issue with either. Both controllers have three main control modes – controlling Analog Lab, controlling your DAW, and the general User presets. Let’s take a look at how both KeyLabs function as a MIDI controller. One of the things that is frustrating about software instruments is clicking around overpacked screens full of knobs with a mouse, and that’s where MIDI controllers with lots of programmable knobs and sliders come in. You load up your favorite software synth, click MIDI learn and map the knobs and sliders to synth functions. Both KeyLabs have user programmable and storable presets – 6 on Essential and 10 on the MK2 – and because both controllers have both USB and MIDI outputs, it’s quite easy to control a few hardware and software synths from one central location. A great features is the ability to give each physical controller a name per template, so if you forget what a knob does, you’ll see its function appear on screen as you use it. You can also have each encoder, fader or pad control a different parameter on a different MIDI channel. Neither device has a MIDI learn function, but the Keylab MK2 does let you program the function of every single encoder, fader or input using the device itself rather than requiring a computer and Arturia’s MIDI Control Center. On the MK2, you can even name the function of each encoder, slider and button on the keyboard itself – which means it truly can be a standalone, computer-less controller. KeyLab MK2 has three bank of each of the 27 controls on the right side of the device, giving you a total of 81 things to control per User preset. Both keyboards can be powered just by USB and they do have 9v inputs in case your USB port doesn’t have enough juice or you want to work directly with hardware synths without a computer at all. Neither unit comes with a power supply. While we’re on the topic of what the hardware can do on its own, without a computer, both keyboards have octave, MIDI channel and transpose functions. Chord programming on KeyLab Essential is basic – you can easily program an interval of one or more notes by holding the chord button and then transposing the chord with the keyboard. This feature is extremely useful for big chords you just can’t reach naturally. The MK2 lets you do all that and more – you can program 2 banks of 16 chords for each of the Analog Lab, Daw and User modes – the Chord Memory mode plays one of 16 programmed chords immediately as you press the pad, and lets you play what you want with your right hand, and the Chord Transpose bank doesn’t play the chord immediately, but rather sets the active chord, which you can then transpose with the keyboard. On both controllers, the pads are velocity and pressure sensitive and can be used to play drums, samples or anything else you want. Bundled with the both KeyLabs are a copy of Ableton Live Lite, and either the UVI Piano (KeyLab Essential) or the Arturia Piano V2 (MK2), and the highlight is a full version of Analog Lab 3. What is Analog Lab you ask? Well, aside from making controllers and synths, Arturia really started out making software emulations of classic vintage hardware synths and electronic instruments. Over the years their V collection, or Virtual Collection now has recreations of over 20 different classic synths. The interesting thing about what they do, aside from recreating the sound, look and feel of the synth, is that they add many optional modern features to each virtual recreation – in the form of either additional panels or effects – sort of like what the original manufacturer would be doing today if they created a new version of their gear with current technology. Analog Lab is a collection of the over 6,000 presets from all those instruments, along with controls to their most important parameters in a unified and simplified interface. If you own the actual soft synth you can open up access to all its parameters. I made an entire video comparing Analog Lab to V Collection with a ton of sound examples so check that out for more info. The integration between the controllers and the software is pretty tight. You can see preset names on screen and navigate the interface quite easily. Most importantly, all important parameters for each synth are mapped and accessible using the encoders and faders, and the parameter names are also visible on screen. Generally speaking the blue labels on the keyboards are intended to correspond with the labels on screen, in many cases they can be quite different on a per instrument basis – custom to the strengths of the given virtual synth. Analog Lab lets you play two keyboard spilts, or layer two synths one on top of the other, and you and toggle between the controls of each using the Part buttons. There’s also a third Live mode where the controls become macros to multiple parameters. Both keyboards are very similar in terms of Analog Lab control, and Keylab MK2 adds direct access to instrument categories such as pianos, electric pianos, pads and more, using the additional row of buttons below the faders. When you put either controller in DAW mode it becomes a remote controller for your DAW. The encoders control track pan and the faders track level. Both keyboards have transport controls, metronome and undo buttons, and the MK2 adds a separate punch in and out buttons rather than one button for both, as well as additional track solo mute and arm buttons, and two more buttons with different custom per-DAW functions. In the Ableton Live template these two extra buttons are used to control automation. Controlling Ableton Live is always a challenge for these types of keyboards because of the additional session or grid view. Both keyboards handle this quite nicely, letting you scroll up and down the scenes using the main central encoder and move right and less across the grid using the Next and Previous buttons. The pads are a window into the Live’s session grid. On Essential the 8 pads represent a horizontal 8×1 row on the grid, and on the MK2 they’re arranged not as a 4×4 grid but rather as two rows of 8 cells each. Connectivity is one of the things that really sets the two apart. KeyLab Essential only has a MIDI Out port, a USB port and a sustain pedal input. As I mentioned before, the 9V power is optional as the unit can be USB powered. KeyLab MK2 on the other hand has substantially more connectivity options – it has a MIDI In, in addition to the MIDI Out, four additional expression pedal inputs, four CV outputs – pitch, gate and two mod outputs, and one CV input. The MK2 also comes with a ground loop isolator in case connecting to external gear causes ground loop noise. More expensive doesn’t always mean better – if weight and portability matter to you – KeyLab Essential is the way to go. That said, KeyLab MK2 is definitely the more premium feeling product with a better keybed, more DAW controls, more Analog Lab controls, a better build, more outputs and inputs, more pads, extra chord banks and better and bigger user presets and controls. When looking at the competitive marketplace, two noteworthy options are Native Instrument’s Komplete Kontrol keyboards and the new Novation SL MkIII. Both these alternatives cost substantially more than either KeyLab. the Komplete Kontrol’s advantage is its door to NI’s content and software, and the SL MkIII has a built in sequencer and tighter integration with Ableton Live, though it doesn’t come with the rich synth content of Analog Lab 3.